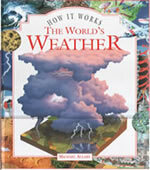 This short book explains why it rains and snows hurricanes tornadoes global warming how scientists measure the air what weather satellites so how weather forecasts are made and much, much more. It's illustrated with full colour drawings on every page. An ideal gift to help with homework and projects for ages 8 to 10.